Nanjing's old city is surrounded by an immense and impressive stone wall, built almost 700 years ago. 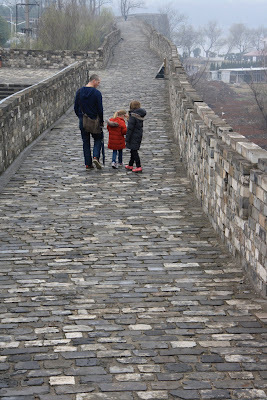 In sections you can climb to the top and walk along a path trod by those who went before - friends, foes, invaders - Nanjing's history hangs heavy in the air at every step. To ensure the quality of the bricks used to build the wall, they came from five different provinces, hence the colour variation, and were imprinted with the name of the brickmaker and the location of the brickworks. Despite 700 years of sun, rain, war and sorrow, these can still be clearly seen on the bricks' surface. History you can touch.